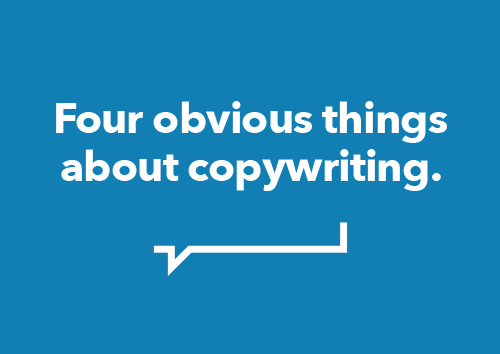 It’s a huge part of a copywriter’s job to ask the right questions. I’m talking about things like “What’s your audience?” or, if I’m in a particularly blunt mood, “Who on earth would buy this?”. A copywriter needs to understand what a client does, how they do it, and why that’s valuable to an audience. They’re questions I throw at clients all the time, particularly in those early stages. One thing I discovered a long time ago was that, if I didn’t ask the question, I’d be the one paying for it when I’m deep in drafts and barely understand what a client is all about. But in 2015 I’ve had it reiterated to me that these things aren’t always nailed down. With most clients, even the more established ones, things like your audience and your USP are always in flux. It’s always up for discussion. Smaller clients and startups? They’re still finding their feet, but often they know their USP better than anyone. After all, it’s all they’ve got to build a business with. Larger brands? They knew the answers once. But over the years they’ve diversified, ventured into new markets, and tried new things. So suddenly it’s become too sprawling to summarise in a sound-bite. The lesson? Don’t ever be tempted to assume people know the answers. Yes, it can be frustrating. Those core components of a brief can be incredibly hard to come by. But you should embrace that fluidity. Where things aren’t defined or clarified, you’ve got a golden opportunity to set that straight. Which could mean more work, or just more control over the project you’re involved with. During 2015, I’ve spent a lot of time working on tone of voice documents and various brand guidelines. Some have been almost completely defined before I came onto the project; others I’ve helped develop from the ground up. It’s enjoyable, creative, and rewarding work. And, being me, I make sure it’s practical work, too – keeping those buzz words out of the way and writing the sort of thing that would really help me write copy later on. Sometimes, those documents call for quantity. You need to articulate and explain what ‘friendly’ (or any other personality trait) might mean, because that’s how you justify your fee. Sad but true. That said, as someone who enjoys the power of language, it’s been fascinating to see how even a single word can make all the difference. One company wanted to describe themselves as ‘straight talking’. That one phrase, thrusted into prime position in the brand guidelines, would flow through everything the company ever said. It was a phrase of ridiculous power and consequence. So, even if we pick something similar but different, it’s going to have a huge impact. In the end, we went for ‘plain speaking’. And do you see how that’s not the same thing? Straight talking is aggressive, blunt, and energetic. Plain speaking is a calmer and simpler – more about transparency than brutal honesty. It reminded me that, at the branding level, every little choice matters. And that’s really exciting. I mean, come on. You’ve already seen how I’ve learned at least two things this year. So it’s only understandable that the amount of money I charge goes up. The thing is, it hasn’t. For about two years. The day rate I quote people now is basically the same as it’s ever been, despite bigger clients, more recognised brands, and at least two pieces of accumulated knowledge per year. So why is that? Because I’ve realised it’s all made-up nonsense anyway. I sometimes offer a day rate so people can compare my pricing to other copywriters but, as some of you might know, I don’t charge by the day unless there’s a very, very good reason for it. Instead, I charge a fixed fee for a project. That way, if I have an off day, a client doesn’t get overcharged. And if I work fast? Go me. But I’ll let you in on a secret. I don’t have many off days (he says, hopefully). I think (based on no scientific measurement whatsoever) that I probably work twice as fast as most clients would expect. I’m usually doing a few different things at once, so perhaps more than one person is paying me for my time that day. So while my day rate has stayed the same, my effective day rate – the amount that I can actually say I earned in a working day – has gone up significantly. As far as I’m concerned, that’s the best of both worlds. I can give people a price that feels fair – and that’s in the reach of startups and smaller businesses. And, providing they get work they’re happy with, who cares how long it takes? If you’ve learned anything this year, do feel free to get in touch and let me know. But if it’s more than two or three things, don’t. I’ll only feel bad.